Aspire Cleito Review - Is it as Good as the Triton and Atlantis? Aspire Cleito Review – Is it as Good as the Triton and Atlantis? It follows up on the success of the Triton and Atlantis tanks. The Aspire Cleito eliminates the requirement for a separate chimney, while still maintaining exceptional performance. So how well does this system work? Read on to find out. Disclosure: All the Sub-Ohm Tanks which we review on this website are tested by our trained, paid staff. As part of the review, VapingDaily.com links directly to the product or brands so that you may purchase directly from the provider. We receive commissions from these providers, however, this does not affect the price you pay, and the commissions we earn help us pay for the costs of running this website. Click here to learn more. Thank you. The Aspire Cleito is a sub-ohm tank with diligence in design, performs excellently and is user-friendly. These great features sell for an astonishingly low price. However, it doesn’t mean that this tank is not worth buying for serious vapers. This is because it caters to both beginners and expert vapers. My purchase price was $18 but it may differ depending on where you purchase it. Aspire isn’t new to the sub-ohm game and have been a part of it for some time now. Their Triton and Atlantis tanks are a testimony to their great tanks. Both of them have remained reputable and the go-to favorites for many. Their popularity lead to the creation of the Aspire Cleito. The core features the same specs as its predecessors. However, they completely redesigned coils. As a result, it doesn’t need a chimney. The design is one of the strongest qualities of this tank. It encompasses all the essential outlook features that one expects from an advanced sub-ohm tank. However, it switched up the design of the atomizer heads to improve performance. The coils in the majority of the available tanks are short. They attach to a main stem on the bottom section and inside the tank. The ones on the Aspire Cleito already have the chimney pre-built. It extends from the base of the tank so the top cap can screw right onto them. Otherwise, the product design is on par with most of the other sub-ohm tanks currently on the market. The diameter is 22mm and the length from top to bottom measures 58mm. This includes the drip tip and the 510 connection. Additionally, the tank’s capacity is 3.5ml. The size may not be enough for some vapers but we personally enjoyed the fact that it finishes soon. Therefore, we can change flavors for the next hit. The Pyrex tube securely attaches to the top portion of the atomizer. Whereas, they keep the bottom in place with the aid of a thick O-ring. This may seem like an impractical design. However, trust us, the assembly is solid and requires some strategic yanking to pull the tube apart. 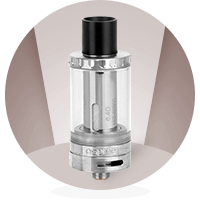 The most prevalent feature of the Aspire Cleito in terms of the inner workings is the coils. There is a 0.2 ohm and 0.4-ohm coil separately. We were more partial towards the latter. We recommend that you not use it above a voltage setting of 55W. This is because you are very likely to get a charcoal-like taste as we did. 40-45W is the best range, producing huge flavorful clouds. The best performance with the optimum power of the 0.2-ohm coil was between 60-65W. Again, we would like to reiterate that the 0.4-ohm coil works better. This one becomes unbearably hot with an unrefined flavor. It produces an exact flavor from the 0.4-ohm coil at a low wattage. Even though the 0.2-ohm coil becomes extremely hot, it takes longer to heat up than the 0.4-ohm coil. This is pretty strange, isn’t it? What is the Vapor Production of the Aspire Cleito Like? The result of the cotton wick coils and open airflow of the Aspire Cleito will be outstanding vapor production. Take our word for it! This contraption has a high resistance atomizer integrated into it which works best between 40-60W. As a result, the vapor output will be more than enough for you. Therefore, the cloud lovers will be happy. Of course, the very best vapor comes from a dripping atomizer. However, this tank is definitely not a bad choice. The flavor from the 0.4ohm coil head was seriously phenomenal. This is another reasons to love it! Furthermore, we were blown away by its quality. This is considering that this tank sells at half the price of a higher end tank. And it still has more or less the same flavor. To give you a better idea about the flavor, it’s similar to the Crown, Rafale and Herakles Plus. Which Accessories Come With the Aspire Cleito? The product itself comes in an elongated case made from plastic, with foam lining on the inside. They divided it into sections. You’ll get the tank, the extra 0.2ohm coil, the Pyrex tube. For the looks, you get four rubber cuffs in different colors and a band with the Aspire branding on it. The kit has all the essentials one could need with a tank. However, we couldn’t help but wish for spare O-rings. This would have been much more handy than the rubber rings. Despite the simplicity of the Aspire Cleito sub-ohm tank, its performance is definitely not simple. It is nothing to scoff at. The product is user-friendly. At the same time, it maintains the formality of a serious vaping product, delivering excellent flavor with huge vapors. This is quite a versatile product for both beginners and expert vapers. The limitations of the Cleito are small and you can overlook them. It’s because these faults all come down to user preference and how much they make use of it. The 0.4-ohm sub ohm coil alone makes this product stand out from its competition. Furthermore, its price is the deal maker! It’s got the intangibles to get the customer to try it and fall in love with it. Looking for the best drip tip for Aerotanks? 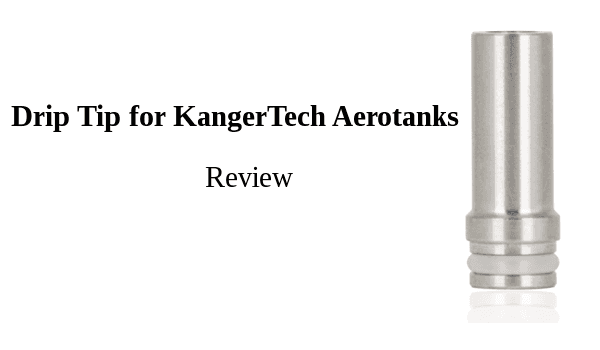 Read our review of the KangerTech drip tips and see how they rank! One of the hottest selling sub-ohm tanks on the market today, the Kanger Subtank Mini has a lot going for it. Read on to learn more. The original cleito seems a bit old now in late 2018, making the Atlantis seem ancient but rest assured they are still not obsolete!!! For any users out there considering upgrading just for the sake, or to keep up with the times I can testify that the cleito AND the Atlantis are still very reasonable, usable tanks and are not irrelevant to this day. I personally use my Atlantis as my go to tank (pre built coils, as my rdta is my #1) everyday. Aside from mesh coils no truly new innovations have overshadowed these tanks.